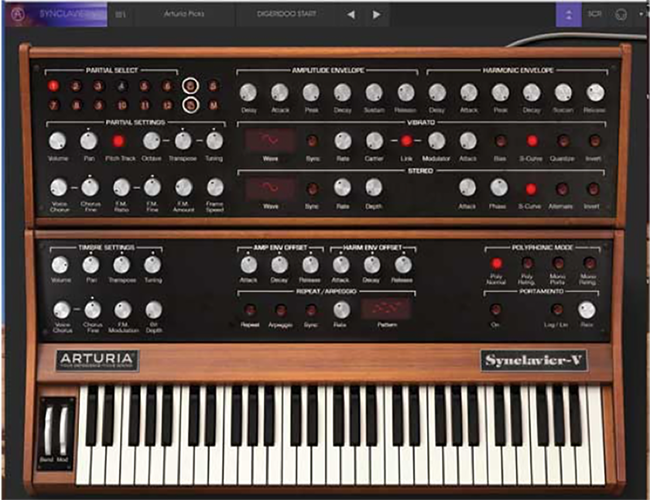 Arturia has been in the game of recreating classic synths virtually for nearly fifteen years, and some would argue that their outstanding virtual instruments are the standard against which others are judged. Though Arturia has unveiled quite a few hardware products over the last few years, they have never neglected their software roots. And with each iteration of the product collection, Arturia has improved the sound, the interface, and the variety of synths in the collection. Arturia V-Collection 5 is now an impressive collection of 17 synths/keyboards, with notable sonic and visual improvements over the previous collection. And with the expansion of the instrument collection came a digital recreation of the NED Synclavier, an ‘80s staple of the big studio that only a handful of top-tier keyboard players every had the opportunity to touch given its astronomical price tag. Just as we were about to go to print with our review of Collection 5, Arturia stopped us in our tracks by releasing Collection 6. Just when we thought things couldn’t get better… they did! V-Collection 6 adds four more instruments: the Buchla Easel, Yamaha DX-7, Clavinet, and most impressive, the Fairlight CMI. 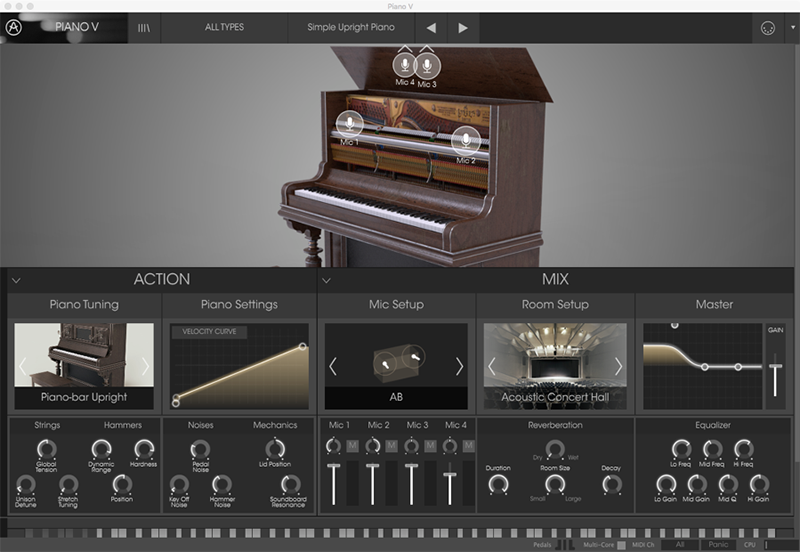 It also adds a few new pianos to the previous Piano V, now upgraded to V2. Now you get 21 synths/keyboards in this collection! We really can’t say enough good things about this collection—this is one of the soft-synth collections against which others are held accountable. V-Collection 6 belongs in any pro studio or keyboard rig, as there’s such a vast landscape covered by the synths. There really is something here for everyone. And, it’s a lot cheaper (and more practical) than trying to purchase and maintain any one of the original synths available here. V5 included 17 plug-ins: Analog Lab, Synclavier V, B-3 V, Mini V, Piano V, Stage-73 V, Matrix-12 V, Farfisa V, Solina V, SEM V, Wurli V, Jup-8 V, ARP 2600 V, CS-80 V, Prophet V, VOX Continental V, and Modular V. The plug-ins new to V5 specifically are the Synclavier V, Piano V, Stage 73 V, B-3 V, and the Farfisa V. Interestingly, Spark 2 is no longer included in V5, though it was included in V4. Also of note, the older V4 plug-ins have all been upgraded in V5. This includes an upgraded preset browser which allows you to enter fine search details to locate a sound, as well as enter comments and tag favorite sounds. In addition to everything mentioned above in the V5 upgrade, the new V6 Collection adds the Buchla Easel, Yamaha DX-7, Hohner Clavinet, and the Fairlight CMI (as well as some updates to the Piano V). Wow! In addition to the TAE True Analog Engine that powers many of the soft synths, Arturia also incorporates physical modeling (which they are calling “Phi”) in many of their acoustic and electro-mechanical emulations. In addition, Analog lab now contains over six thousand sounds, giving you quick access to the entire collection. All GUIs are now resizable, allowing things to be as big or as small as you like. This is not a minor thing! Many of the UHD/high-resolution/Retina displays these days make graphics and type very hard to read unless the graphics are coded for the new displays. Being able to see what you are doing definitely helps workflow, and this feature alone should have V4 and older users scrambling for an update. It is also noted that these cost between $25,000 and $200,000, so only an elite group of people had access to these, which included: The Cure, New Order, George Duke, Pat Metheny, Sting, Stevie Wonder, Paul Simon, Foreigner, Michael Jackson, Kraftwerk, Depeche Mode, Genesis, Kim Wilde, The Cars, Soft Cell, Geoff Downes, Frank Zappa, and film composer Alan Silvestri. Well, that’s not true anymore, thanks to Arturia! In fact, Cameron Jones, who wrote the original Synclavier’s OS, was involved in Arturia’s development effort. The original Synclavier had four Partial Timbres (used to create a full patch), and Arturia has expanded this to twelve. Hey, why stop at one Synclavier when you can have three? Each of these can be assigned “Time Slices,” which allow for motion within the sound. If this sounds unusual, don’t be alarmed. The original synth was complicated, combining additive synthesis, FM synthesis, and (eventually) sampling. Just to quickly review the Synclavier’s approach to sound: A single voice can contain up to 12 “partials.” Each partial consists of a two-operator FM synth, with both the carrier and modulator offering additive capabilities. This allows you to sculpt the levels and phase of up to 24 discrete harmonics for each, then apply envelopes for volume (carrier) and timbre (modulator) to animate the sound. Each of the 12 partials includes settings for volume, pan, transposition, FM level, additional FM ratio and fine-tuning controls, and keyboard tracking. You can also key-map each partial to a specific keyboard range, with phase-accurate cross-fading. There are also performance elements for each partial, which offer up the ability to assign velocity, aftertouch, and expression pedal to 16 destinations, including FM amount and time-slicing rates, as well as more common destinations like volume, tuning, and pan. There are also up to three effects which you can use at a time (flanger, phaser, chorus, delay, reverb, dubdelay). So, as you can see, there’s a lot going on in a Synclavier sound! We were impressed by Arturia’s user interface design. Clicking the double arrows in the right upper screen brings up another panel of the synth, providing access to more parameters, which you can see in the image above. By clicking the corresponding tab, you’ll get access to the mixer, effects, envelope, time slices, and key dynamics pages. While the architecture of the Synclavier is complex, Arturia utilizes many graphical representations to make things (a little!) easier to understand. While the presets are quite good, those willing to go beyond this will enjoy having this monster in the studio. The one notable exclusion from the classic board’s feature set is that the Synclavier V currently is not able to sample, as the original hardware could. 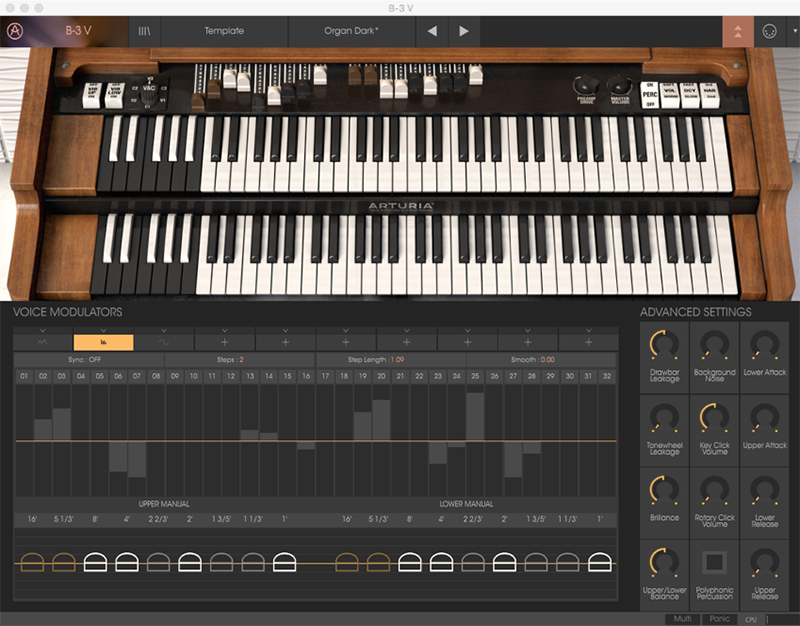 Given Arturia’s synth tendencies, it was a little surprising to see them go into piano, electromechanical, and organ realms—not that we’re complaining, and with V5, they took a big leap into this instrument category. Traditional effects are present, including vibrato, chorus, overdrive, phaser, analog delay, and Leslie cabinet settings such as rotor speed, acceleration, and brake. Other parameters are also available, such as tonewheel and drawbar leakage, key-click volume, and the balance between manuals. You can also assign independent transpositions and MIDI channels to the manuals: This is handy if you’d like to use multiple independent MIDI controllers. The Farfisa Organ rose to fame in many ‘60s hits, but it was also heard on quite a few hits in the ‘70s and ‘80s. This transistor organ, like the similar Vox organ, owes it sound, in part, to the effects used on it, which Arturia has done a nice job with. Besides good sounding presets, the five effects: flanger, phaser, chorus, analog delay, and overdrive, can be placed in any order, which is really cool for those signal-chain obsessed (and you know who you are). Another cool feature is that the amp not only has the expected volume/low/mid/high controls, but also has a switch to move the microphone placement on or off axis. Despite all this, what makes this emulation stand out is that you can go way beyond the usual Farfisa sounds. Again, by clicking the right-corner double arrow tab, the lid of the Farfisa slides off and you are given not only multiple reverb types to choose from, but on the right you get 48 faders that operate as volume controls (for harmonics), and an interesting way to shape a waveform, by “drawing” it in. This is an interesting way of using additive synthesis, and we were impressed by the warm and unusual sounds that we were able to get (some approached synth territory). You may also tune individual voices, and choose polyphonic or paraphonic modes. Of course, the classic Farfisa buttons are there, too: flute, oboe, strings, etc., but you can access those without having to “remove” the lid. As you can guess by the name, this is a Rhodes emulation. And while there is no shortage of emulations these days, Arturia has entered the fray with a plug-in that sounds good and has some unique features. Remarkably, this is modeled, and not sampled. With the virtual lid down, you get your basic tone and volume control, with a cool switch that toggles between ‘73 and ‘74 models. “Under” the Rhodes is an unnamed amp, but likely a Fender Twin by looks and historical use. Besides the expected tone controls there is also a mic placement switch (axis/off axis), which again, has a lot of impact on the final sound. As anyone with a Rhodes knows, the effects are a big part of the sound, and you get chorus, flanger, phaser, delay, compressor, overdrive, and a couple of wah-wah pedal types (wah and auto-wah). Dynamics, hammer hardness, and hammer noise. Perhaps even cooler, with the lid down, a computer screen appears underneath the Rhodes that encourages you to draw your own velocity curve. While you could leave it linear—which means the harder you play the harder the velocity, volume, etc.—you could draw this any way you want. Just to see, we inverted the velocity curve and found that the harder we played, the softer the sound became. With the use of effects, this could provide some interesting textures depending on your curve and you play. We have to admit, we weren’t expecting electromechanical pianos from Arturia, but they did a nice job with the Stage-73 V.
Besides the piano model type, you can adjust tuning, hardness, pedal and hammer noise, lid position, and soundboard resonance. A cool detail is that mic placement—and there are four mics—changes based upon the selected piano. There are also settings for room setup (14 reverbs), Master (EQ), and a separate gain slider. There is also a cool equalizer that has individual knobs, but also lets you graphically draw the EQ curve. Similarly, you can optionally draw the keyboard velocity curve. We have been reviewing modeled pianos for years, and we think Arturia’s first attempt competes quite admirably with the establishment. V Collection 6 also adds three more Pianos to Piano V, including a Plucked Grand and a Japanese Grand (presumably a Yamaha). Additionally, two new mic placements are available: player perspective and “under,” which, just as it sounds, is mic placement under the piano. The original V5 pianos sound slightly more realistic, too. 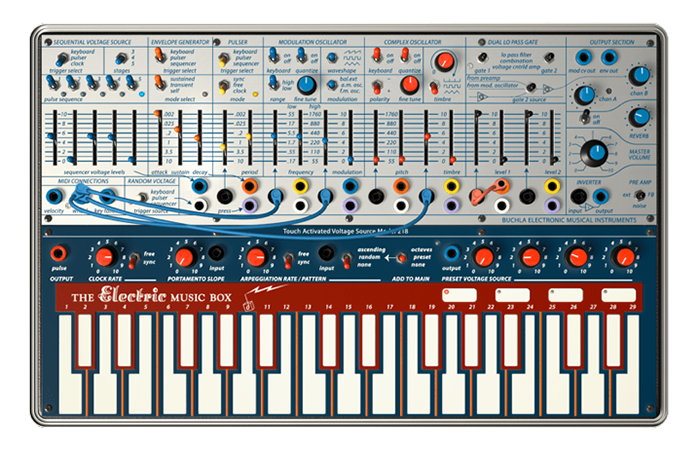 The Buchla Music Easel was released in 1973, and was a suitcase-sized, semi-modular synth. A bit of an experiment, the Buchla Easel (hereby referred to as “BE”), was best at creating ambient textures and sequences. As per Arturia, inventor Don Buchla represented “West Coast Synthesis” in contrast to Bob Moog, who represented “East Coast Synthesis” in the early 1970s. It included what would become signature West Coast features like additive/modulation-focused synthesis, integral sequencer and clock triggering, separate non-triggered oscillator gain controls, and filter/gate combinations. It was semi-modular, with essential hardwired connections augmented by patch points concentrated in a common area, designed to reduce some of the patching. Arturia’s recreation has the keyboard at the bottom, knobs for controls like the arpeggiator in the middle, patch points and virtual cords above that, and then controls for sequential voltage source, envelope generator, pulser, complex oscillator, dual lo pass gate, and output section above that. The double arrow on the upper right then brings the control section down, revealing additional screens of control. Of note, the Modulation Oscillator can perform as a secondary audible oscillator, used for frequency or amplitude modulation, or can be tuned to subsonic frequencies to serve as an LFO. Patches get created by dragging short, color-coded cables to different destinations. The color-coding serves to identify the sources and destinations: orange identifies patch connections to and from the Envelope Generator, purple signifies key pressure, and blue designates the complex oscillator. Usually a source can have multiple destinations, and you can simply drag another cable which will appear at the source when you click on it. You can also route MIDI Velocity, Modulation Wheel, or Note Number messages. On pressing the double arrow at the upper right side, the four screens become accessible from a column on the left labeled Right Hand, Left Hand, Gravity, and Effects. The Left Hand panel allows you to add complex envelopes of up to five destinations. Click on the adjoining rectangle and choose a module and the parameter you’d like to modulate; for example, selecting Modulation Oscillator and its waveform type. The Right Hand is the sequencer section, and input is reminiscent of a simple, step-entry piano roll. The sequencer is polyphonic, and you can get up to 32 steps as well as randomize gate times. Speaking of polyphony, the BE is up to four-voice polyphonic. The effect section provides up to two simultaneous effects, with the typical inclusion of delay, phaser, chorus, and so on. You may also choose gate responses in this section. Perhaps the most interesting control in this list is the Gravity section (see figure above). You have the ability to create complex modulation using tools represented graphically as objects: Repellers, Planets, Walls, and Wormholes. These are used to attract or repel a “projectile” initiated by triggering a note. You can grab objects and drag them (from the right of the graph, up to four of each type) into the graph, or “Universe”—essentially an X/Y axis with two modulation routings per pole. Repellers are small spheres that bounce the triggered projectile on collision, Planets have a gravitational pull. Walls bounce and contain projectile ballistics, and can emit their own triggers. Wormholes are pairs of objects that can be positioned individually, and can transport the projectile from one area to another. For those just wanting to avoid all of this (at least at first), there are 256 presets to get you going. We admit, we weren’t terribly familiar with the BE, but you can definitely get some cool, unusual, movie score-esque sounds out of it! Don’t let its multi-colored controls make you think it is a toy. The programming may not be for everyone, but we think that was kind of the point when it was created—to do things a little differently. And who doesn’t like using something that involves a wormhole? After our almost-published review of the V Collection 5 was complete, the MusicPlayers.com editors took friendly bets amongst ourselves about which landmark synth would be recreated next. 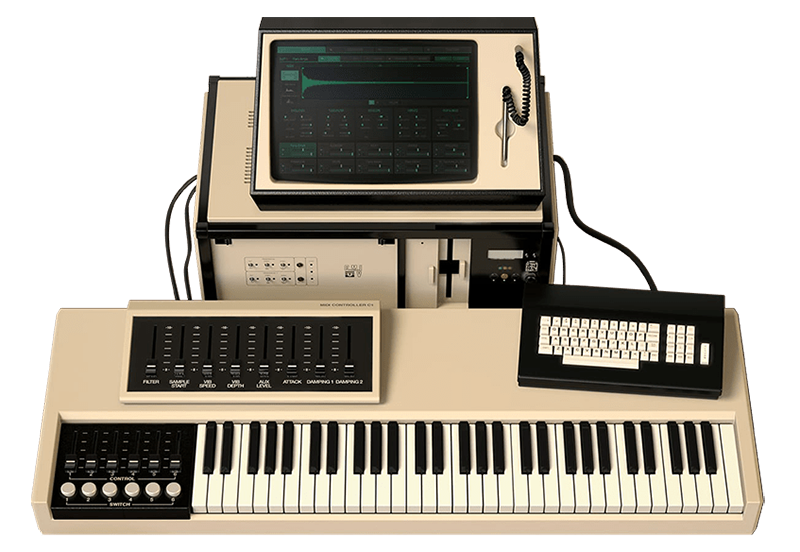 Two of us agreed that the Fairlight would be a really cool piece of equipment to recreate, as we are old enough to know its power but were too early in our careers to afford anything close to it at the time of its introduction. High fives went around the studio when we saw this. For those unfamiliar, the CMI (Computer Musical Instrument) originally came about in 1979, and underwent several refinements. Besides introducing the world to sampling, it also featured something else that was groundbreaking—the ability to draw envelopes for each of a waveform’s 64 harmonics on a screen using a light pen. It could also display the Fourier transforms in 3D. It was further distinguished by a QWERTY keyboard, a large CPU box, based on the then-new, 8-bit Motorola 6800, with an original spec of playback at only 10kHz! Subsequent revisions upgraded the specs and features, ultimately resulting in the IIx revision in 1984 which included the then-new MIDI specification, which is the model Arturia has recreated. If you have ever listened to Peter Gabriel, Kate Bush, Herbie Hancock, Yes, Tears for Fears, Duran Duran, or Jan Hammer (just to name a few), you have heard the CMI! 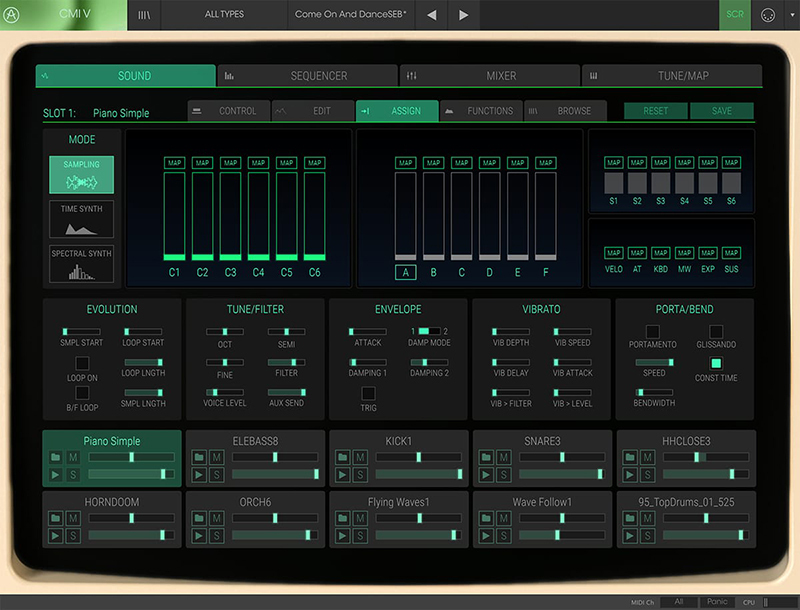 Arturia’s CMI allows for up to 10 instruments at once, which you can mix, layer, split and sequence as you see fit. Each instrument can be saved individually, as well as be part of a “combination” preset. Besides the tools of sampling, the CMI V also incorporates the original additive synthesis engine, allowing you to control the harmonics over time. Additionally, Arturia has added a simplified version of using additive synthesis in what they call Spectral Synth. You also get about 300 presets, which includes the original library—many of which we could easily recognize from the hits they were used on (and occasionally by their patch names). As you also have the ability to load in your own samples (16-bit, 44.1kHz samples up to 30 seconds in length), change them to waveshapes, modify them, then change them back to samples, the sky really is the limit to what you’re able to do if you are willing to invest the time! The CMI is divided into four main pages: Sound, Sequencer, Mixer, and Tune/Map. Each page has its further submenus. The sound page, not surprisingly, hosts the three main synthesizer engines: Sample, Time Synth, and Spectral Synth. As mentioned, you can have up to 10 samples in a preset, but keep in mind that although you can specify range, there’s no velocity cross-fading. Using the Time Synth, the additive synth engine allows you to alter your sound by dragging multiple breakpoints on the independent envelopes for each of 32 harmonics. A real-time oscilloscope helps you visualize all of this. The original CMI used simple sine waves, which Arturia has expanded upon. Spectral Synth mode gives you a different take on additive synthesis. Rather than setting the individual harmonics, you control a distribution curve of harmonics, with controls including Center, Spread, Bias and Fundamental Boost. Modulating these parameters with functions and controllers provides another way to animate your sounds. The Sound page also gives access to the Assign tab, which lets you map control and modulation sources to just about any system parameter. Click the Map button above the desired source, click/drag the parameter you want to control in the lower panel to the desired offset amount, and click the Map button again to commit. You can also map a single control or modulation source to multiple parameters simultaneously, just by hovering above a map button. 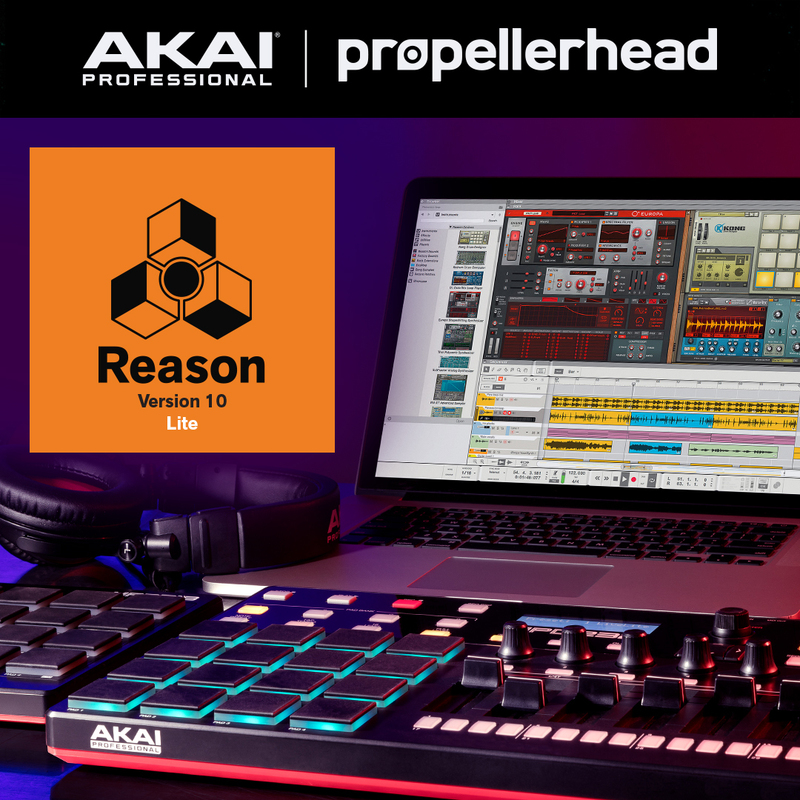 Furthermore, each instrument has its own six independent Functions you can set up as envelopes, LFOs, and tracking curves, to be mapped to destinations on the Assign tab. 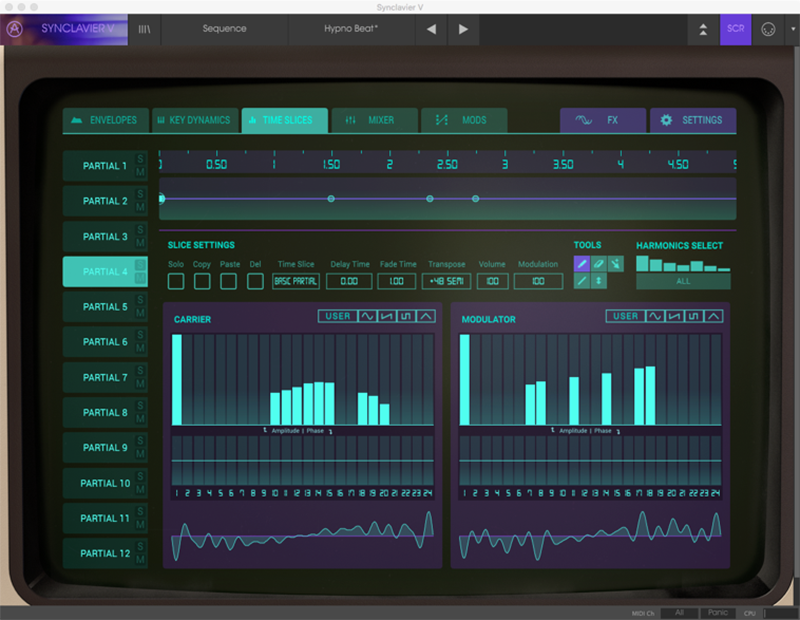 The Sequencer is Arutria’s version of the CMI’s original Page R, which was the first commercially available, screen-based, pattern sequencer. Page R is crude by today’s standards, but Arturia included it to be faithful to the original. The pattern grid has been updated, though, and now allows real-time transposition, includes two more tracks, implements polyrhythm mode with variable track lengths, and incorporates swing. The Mixer allows control over the CMI V’s ten instrument channels in stereo, including an aux bus and master. There’s also 13 effects, including a Leslie rotating speaker and the “bit-smashing Destroy.” You can route one effect per instrument, one on the aux return, and two on the master. The Tune/Map page lets you specify the root note, range, MIDI response channel, and polyphony for each individual instrument slot—allowing splits and layers for performance, instrument stacking options, or DAW assignments. This page also lets you create microtunings and adjust temperament. Arturia, like their other offerings, allows much of the CMI to be mapped to a MIDI controller, including sliders available on the assign page. There’s no question that Arturia has upped to ante by increasing the capabilities from the original specs, but all the great things the the CMI did are all still there. Like many great synths, this one isn’t just about scanning through the presets (though they’re good). This is about manipulating a sound into something original and great. There’s going to be a learning curve with the Fairlight, but it’s well worth the effort. And if you’re comfortable with sampling and/or additive synthesis, you’ll be right at home in short order. 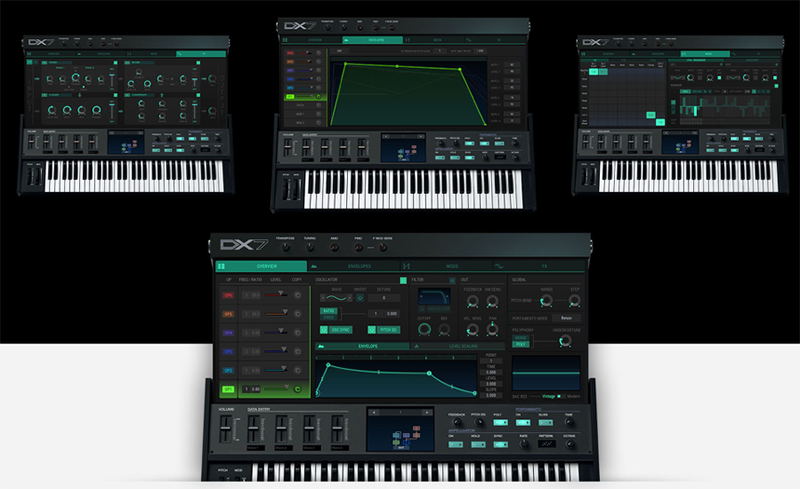 The DX7, introduced in 1983, was a landmark synth at the time. Utilizing FM synthesis, the six-operator, 32 algorithm, 16-voice synth allowed musicians to have more accurate emulations of acoustic sounds using then-new technology. The downside of the DX7, and FM synthesis in general, was that it was challenging to program, and the original keyboard had only 32 memory locations for storage (and one cartridge slot for additional space). Nevertheless, the DX7 was unquestionably all over 1980s hits, including many from Howard Jones, Sting, Phil Collins, Steve Winwood, Tina Tunrner, A-ha… just to name a few! The DX7 V still needs you to understand how FM modulation works: how oscillators, modulation, carrier waveforms, and algorithms interact. However, since this is software, you are no longer limited to a tiny hardware screen on a synth. Basic information is found on the initial “startup” screen, including sliders, portamento, and arpeggiator controls. The center screen has a graphical representation of the 32 algorithms, which you can scroll through, and the graphic changes accordingly. Clicking on the double arrows at the top left leads you to four more screens to graphically see what the operators, algorithms, and modulations are doing, and how they relate to each other. This also provides access to the effects section as well. The Overview and Envelope screens give you color-coded operators in graphical form, and include the expected DX7 parameters. An interesting addition is that instead of only having sine waves as in the original DX7, you now have many additional waveforms to select, including some from the TX81Z, Additive synthesis, and the OPL2 and 3. When you hover over a name, you see a graphic representation underneath. Who knew there was a camel sine wave? The Envelope screen offers a choice of the original DX7 Envelope Generator, DADSR, and Multi-Segment (MSEG) types. MSEG allows for up to 16 points with independent rates and levels, and the ability to drag curvilinear slopes between stages. Again, this is another complex synthesizer, but full of many great options for those willing to get to know it. The Modulation section is very useful, and presents a Matrix of sources and destinations, all arranged on an 8x8 square. Next to this is a step sequencer, something the original did not have. Even better, the sequencer can play notes while also performing modulations! While FM synthesis may not be the easiest to work with, Arturia has done a great job of bringing the DX7 to the modern age in a much more robust form, and has made the process of editing sounds less painful than it used to be. In another surprise move, Arturia introduced the Clavinet V, an electromechanical piano, not a synth. Introduced in the 1970s, the sound is all over Stevie Wonder and K.C. & the Sunshine Band hits to name just a few. 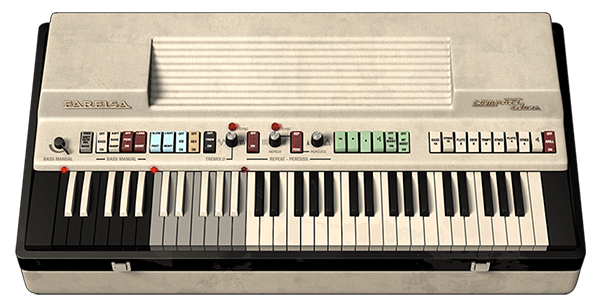 Arturia uses physical modeling, not sampling, to recreate the Hohner model D. The original sound was produced by keys hitting strings, and two pickups, like a guitar, carried the sound via electric current. The switches for the pickups are at the left side of the keyboard, which also include basic EQ settings. The Mute slider on the far right of the keyboard serves to dampen the attack and tone. Clicking on the double arrows at the top left opens another panel, as if “looking” into the Clavinet. Here, you can choose the harmonic profile via a pull down menu, and there are eight knobs that give you access to things like string resonance, key release noise, hammer hardness, hammer noise, pickup noise, and so on. Underneath the Clav is an amp (presumably a Fender Silverface) and pedals for effects. Interestingly, on the amp there is a switch for on/off axis, to toggle between how a modeled Shure SM57 is miking the amp. 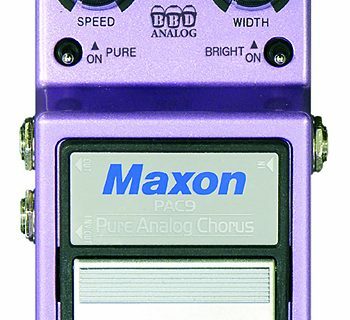 The effects include the expected delay, chorus, flange, wah, compression, and filters. The Clav sounded surprisingly good, and definitely better than we were expecting. It’s simple to use and has just the right amount of controls to keep things streamlined but offering generous sonic choices. One thing that we have hoped for over the years, and is particularly true now with V5 and V6, is a uniform GUI for all the instruments. Sure, each instrument has its own graphical re-creation, but the patch browser is essentially the same in all products, which enables you to search for sounds by various meta data characteristics. Similarly, accessing additional editing parameters and saving sounds is uniform across instruments, which really does improve the user experience as you’re not reinventing the wheel with each new plug-in. One other cool, shared feature is the MIDI learn function. Click the MIDI icon in the right top corner of the window and any knob that’s assignable turns purple, allowing you to then assign it to whatever MIDI controller you like. One point of clarification: although you get 21 plug-ins in this collection, technically you’re getting 20 different instruments. The 21st plug-in is Analog Lab 3, which combines all the presets from VC6—6,000 of them—in one interface. You don’t get the deep editing capabilities of the dedicated parent plug-in, but it’s a great way to access all of the sounds at once. While controls are perfected mated to Arturia’s own Keylab series of MIDI controllers, V5 and V6 are also NKS compatible, allowing it to be easily integrated with Native Instrument’s line of controllers, too. Downloading and authorization is a streamlined process via the Arturia Software Center, which automates downloads and installations for you (other manufacturers of software bundles should take note). 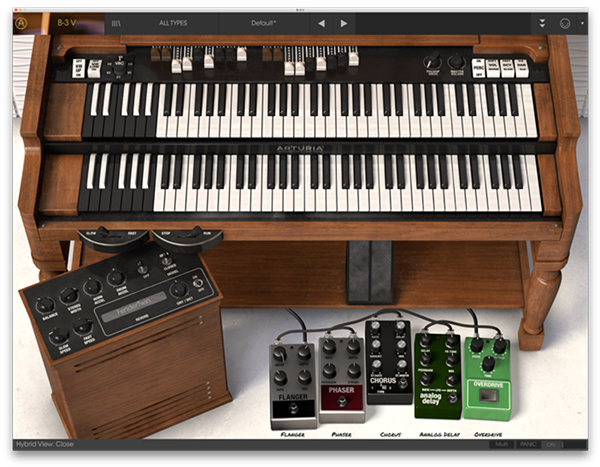 The virtual instruments work standalone or as VST, AAX, and AU plug-ins. Modeling makes for a much smaller footprint than sampling, and the entire collection of instruments requires less than 9GB of hard drive space. We have used Arturia plug-ins in our studios for quite a few years, and Arturia has really stepped it up on the user experience. While the plug-ins always sounded good, sometimes the user interface was a little clunky, and certainly inconsistent from one virtual instrument to the next. The uniform browser is a big improvement, and makes it easy not only to find a specific sound in a given plug-in, but since it’s essentially the same methodology in each one, once you get it, you’re not relearning with every plug-in. Similarly, MIDI learn worked well, too. As previously described, clicking on the MIDI icon allowed for easy controller assignments, and it was the same process for all plug-ins. 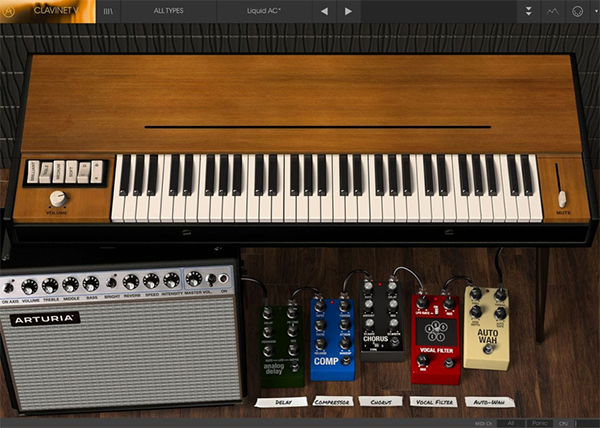 Looking at these plug-ins is so much better now on our Apple MacBook Pro with Retina display! The ability to resize the instrument windows worked well. We used to be unhappy that we might need one size plug-in window for a laptop and a larger one for the desktop studio computer, but had no way to address that. No longer is this an issue. The implementation of the virtual Synclavier was excellent. There’s a lot of sound architecture buried within a Synclavier preset, and we had a lot of fun experimenting with this unique instrument. Despite the complexity, Arturia has done a good job of using graphics where possible to help us out with adjusting parameters (i.e., drawing velocity curves). It wasn’t long before we were able to achieve useful new sounds from this instrument that was formerly just the stuff of dreams. Similarly, the CMI has “come to earth” for the rest of us who couldn’t get one in its heyday, and the DX7 has now become more powerful and easier to use. As a whole, the V6 instruments are uniformly easy-to-use, and if you’re new to the collection, classic synths from Roland and Moog have the simplicity and familiarity you’d expect. 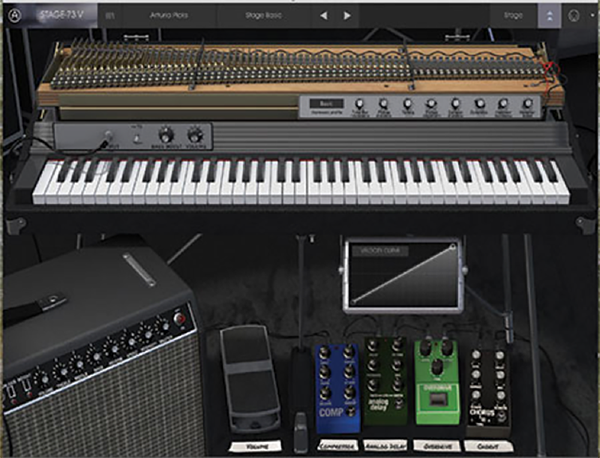 Coaxing the right kinds of sounds out of each instrument requires learning a bit about each instrument’s sound architecture, but the plug-ins never get in the way of the experience of building sounds on the classic instruments. We found most of our time was spent playing and exploring, with very little time spent asking “How do I do xyz?” Perhaps that’s the highest compliment we can give. With 21 plug-ins, we could write pages on all the sounds. Short of that, suffice to say that this collection sounds great. The plug-ins that have been updated from earlier releases sound to our ears a little more polished, and there seems to be smoother transitions when switching between presets. We also noticed that there seemed to be less CPU drain on our machine, so it seems evident that Arturia continues to refine and improve the existing virtual instruments while expanding the collection. Looking back at some staples in the collection, the JP-8V is one of our favorites, and we first reviewed it 10 years ago! It was impressive back then, and after 10 years and now at version 3 (in Collection 5), it sounds and responds better than ever. Those classic, sweeping sounds and arpeggiations are all there, and legendary artists like Jean-Michel Jarre have even contributed sound banks to the virtual instrument. Another one of our favorites is the Yamaha CS-80. This behemoth synth was huge in both sound and physical weight. We were fortunate enough to play Stevie Wonder’s personal CS-80 while it was on display at the Winter NAMM Show for Yamaha’s 150 Anniversary, but short of that, when we need this innovative synth’s sound, Arturia is where we turn. The CS-80’s sounds were, and still are, unique. Like the other synths in the collection, each iteration has improved upon the previous version, sometimes adding features not found on the original (i.e., including some additional waveforms). People are still inspired by this synth, and you can find patches online that come pretty darn close to the Vangelis, “Bladerunner” lead sound (yes, he used the real thing back then). New modulations and arpeggiators, not present on the original, have also opened up sound design to reach far beyond the original. This is an easy go-to synth for your projects. The classic Sequential Prophet-5 and Prophet-VS are wrapped up cleverly into a single synth that we could spend days with. You can use one synth or the other, and we love the rich analog warmth of the Prophet-5 model. The Prophet-VS was the first synth to popularize wave sequencing, and you can hear it on plenty of ‘80s-era Rush albums, and at the touch of a button in the interface, the plug-in morphs into a new hybrid synthesizer that combines both Prophets into one entirely new synth creation. We could spend days writing about all of the other synths—we didn’t even delve into Moog territory, but we just don’t have the space for that in this review (and there are numerous reviews out there already if you want to learn more). Of the new plug-ins, the Synclavier is really an accomplishment. While at times it enters DX7 territory as it incorporates FM synthesis, it really is so much more. Getting the most out of the Synclavier requires knowledge of both additive and FM synthesis, but those with patience and significant sound design skills are going to be amazed at what you can do. Leads, pads, sound effects, and odd, animated sequences are all at your disposal. There’s no question, sonically speaking, that this is a digital synth, but we mean this in a good way. Similarly, the CMI is really an amazing thing to have access to. It really is more than an early sampler. It was an ecosystem that used sampling, but its synthesis and processing abilities—even with the limited processing power of the day—created unique and engaging sounds. This has only gotten better with today’s modern technology and Arturia’s implementation. We have only had time to scratch the surface ourselves. The DX7, admittedly, has been recreated before by others, but Arturia’s take on it has made it much easier to program than the original. With effects, modulation, and sequencing, it has also become a much more modern, relevant synth. We have a classic Yamaha TX802 in our studio, which technically is more like a DX7 II than the original DX7. So while we couldn’t find the exact same preset name, we compared presets as close in name as possible (i.e., “strings” vs “strings 1”), and we have to say, they were pretty close! Not to mention, two computer screens is a hell of a lot easier to program and navigate compared with the two-line LCD display of the TX802! The B3 organ sounds good, though we have heard other emulations that were more aggressive sounding. However, with a little tweaking, you can get more aggressive sounding, and then (as previously described), you can take these sounds to places typical virtual organs never go. Similarly, the Piano sounds good, and at times, great. 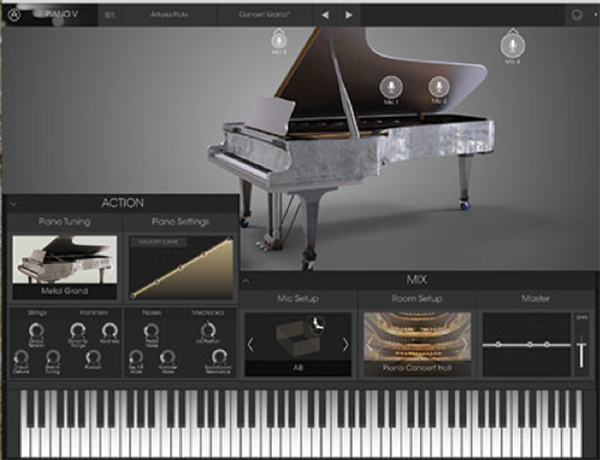 It certainly is an achievement of piano modeling technology. Would it beat out a high-end, multi-sampled sound set? Not yet, but we would not be ashamed to use these quality pianos on stage or in the studio, either. In truth, V2 is actually a little more polished, and getting closer to that bar. The Farfisa definitely gets the retro vibe correct. We have not had much opportunity to play one of these originals ourselves, but have heard enough of them on classic recordings to know that Arturia nailed the sound here, and we like how Arturia takes the familiar sounds and then moves them into very interesting territory with a synth-like implementation. The Stage-73, like the Piano, is not quite as aggressive sounding as some other virtual re-creations of the iconic stage piano. It’s easy to tweak, though, so with a little fiddling we were able to get a little more bark out of it and would be satisfied if this were the only Rhodes in our collection. 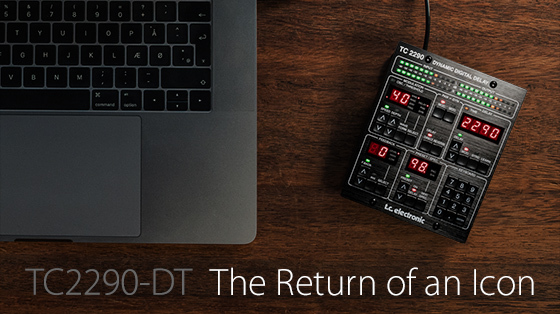 Given that the Stage-73 plug-in is actually modeled (as opposed to sample playback), we’re impressed nonetheless. At the end of the day, you’ll want the V-Collection because the soft synths in the collection sound fantastic. 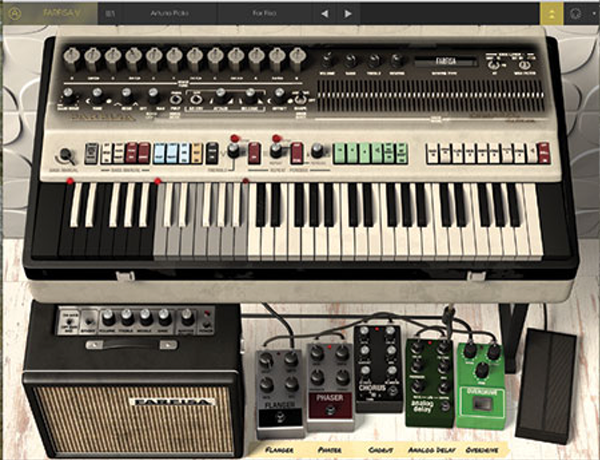 If you need an ARP 2600, Yamaha CS-80, Prophet-5, or a Minimoog, etc… these are the go-to virtual instruments. Arturia does a great job modeling the classic synths in the collection, and we love the faithful user interfaces. Now including some basic, bread-and-butter, electro-mechanical and acoustic instruments, plus several of the most expensive, lust-worthy, classic digital synths ever built, this great collection is better than ever. 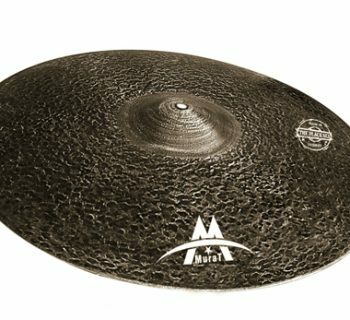 While it is pretty easy to figure things out, there are manuals online (and downloadable) for each instrument. It’s a little annoying that there’s no master download containing all of the manuals in one place—you have to download each one individually. Given that they are small files, it doesn’t take too long, but as a Mac user, when you have to download, open in preview, then find a place to save, etc… it can be tedious. Arturia’s V-Collection 6 sells for $499, which may seem a little high to some, but divided by 21 plug-ins, this works out to roughly $29 each. Considering that so many of these virtual synths are monstrously capable synths that could take years to fully explore, this bundle is easily worth the price given the outstanding sounding collection of virtual instruments and their great usability.